Was Laurens Hammond a time traveller? The inventor of the world‑famous Hammond organ certainly created a temporal blip when he launched a polyphonic synthesizer in 1939. And what a synthesizer! 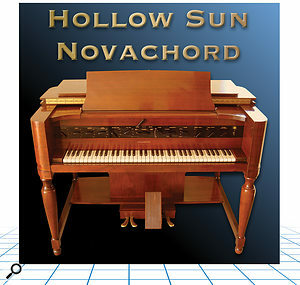 Weighing a quarter of a ton and housed in a magnificent wooden cabinet, the Novachord was a 72‑note polyphonic synthesizer with envelope shapers and LFOs for each and every note, and a global EQ section with triple resonators and high/low pass filters. It also contained 163 tubes, thousands of capacitors and several miles of hand‑soldered wiring. Featured in many 1940s film soundtracks, only just over a thousand Novachords were made before the Second World War made parts difficult to get hold of. This model was rescued in a dilapidated state and lovingly restored by Dan Wilson of Bath in the UK, before being carefully sampled by Hollow Sun's Steve Howell. He's done a grand job, with many presets having different hand‑crafted samples for each and every key, and with carefully tailored Kontakt effects including EQ, filtering, chorus, delay and some layering and reverb to 'flesh out' the basic sounds. The Novachord character always shines through. From the moment you load the first of the 120 presets, it's obvious that you're playing a living, breathing instrument full of quirks, and it's these imperfections that bring everything to life. This library exudes warmth, a little grain and wheeziness, plus a dash of authentic hum, low‑end rumble and background noise. The subtle tuning differences between notes — as well as timbral and envelope variations — constantly remind you that it's 100 percent analogue. Reinforced by preset names such as 'Arcing Coils', 'Glass Filaments' and 'Tesla Strings', you can almost smell the warm Bakelite and glowing tubes. But it's the sounds themselves that are most inspiring. For me, the undoubted highlights of the collection are the very varied string pads, since each Novachord key sounds slightly different and has its own vibrato. The evolving synth pads are also rich and varied, with the various resonators providing some unusual and sometimes almost sinister timbres. However, using layering and filtering, Steve has also managed to coax more modern sounds from the Novachord, such as synth basses (including a rather nice Taurus bass-pedal emulation) and some effective filter sweeps. The various emulated brass, woodwind and even vocal‑like ensembles all have a certain charm, as do the clutch of special effects, and, of course (given the Hammond heritage), some organ sounds do put in an appearance as well. I felt that the piano/harpsichord emulations were the weakest offerings, but even these provide some unusual timbres, particularly in the lower registers. Download: Kontakt 3 £79; EXS24 £50; Reason Refill £50. Prices include VAT. Download: Kontakt 3 $120, EXS24 $80, Refill $80.